Our childhood was a bit unusual; my sister recently described our Easter celebrations. Think Laura Ingalls Wilder – we were Little House in the Big Woods set the 20th century. My mom was a real foodie before there was ever such a term. In our house were no refined vegetable oils or refined sugar, but lots of produce from the garden and mountain pastured meat. She never follows a recipe but gathers ideas and puts her own twist on a dish. A handful of this, a pinch of that. The only time I remember her actually following a recipe, it was inedible. She had clipped a recipe from a magazine for rhubarb lamb stew and followed it to the T. It was so incredibly sour. We attempted to save it with piles of honey, but even that couldn’t rescue the stew, and we gave it to the dog. Even he didn’t want it. Despite that story, however, she is an amazing cook. Food from her hands tastes like home, like comfort, like happy childhood memories. We’re a family of cooks – my father is also a superb cook and all us four children cook well. But now I embrace that weirdness. It’s given my siblings and me a sense of culinary adventure and appreciation for different tastes. Even if it shocks others. Like the time I first slept over at someone’s house. In the morning my friend’s mother asked me what I would like with my oatmeal porridge, expecting a difference of brown sugar vs. honey, or cream vs. butter. “Please,” I asked innocently, “may I have sardines and soy sauce?” (I don’t actually remember this, but it’s become A Family Story.) It’s actually very good, try it sometime! 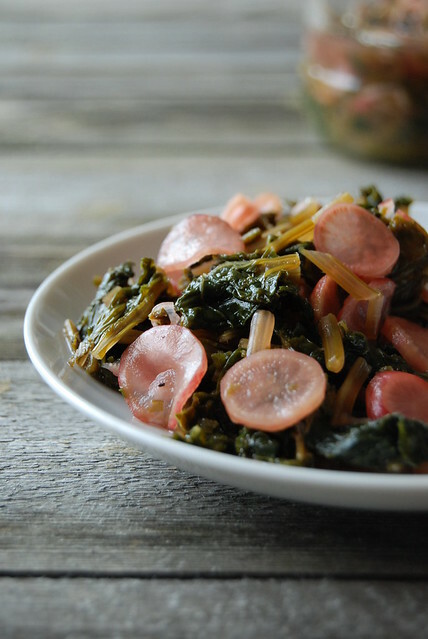 Mom learned to cook many Japanese foods, one of them being these fermented radish top pickles. Japanese food is famous for having a million little dishes and dozens of condiments. She would sprinkle them with salt, pack it in a bowl with a small plate overtop, and let it sit. Dad would eat it with rice or porridge. So, in honour of Mother’s Day, here is a recipe. Radish tops are edible but are rather prickly; fermenting them eliminates the prickles and fills them with good for you probiotics. They go well with any grain, if you eat grains, or together with red meat. Maybe in a salad or topping a hamburger? It was a perfect garnish for beef stew. How did your childhood and/or mom influence your food choices? Gently rinse any dirt from radishes and radish tops. Thinly slice radishes. Coursely chop radish tops in 2cm/1inch chunks. In a bowl, sprinkle radishes and tops with salt, massage with your hands until the juice starts to flow. Pack it into a small jar, top with enough water to make sure the vegetables are submerged. Put a lid on the jar and let sit at room temperature for two to three days, then transfer to the fridge. This entry was posted in Food and tagged AIP, dairy free, egg free, fermented & cultured, GAPS, gluten free, grain free, nut free, paleo, raw, salads, side dishes & starters, spring, summer, vegetables, vegetarian. Bookmark the permalink. I hope I can hand down the same lifestyle to my kids! My oldest daughter groans when she gets rice balls for her snack at school, and I tell her that’s nothing 🙂 Thanks for hosting, glad you like the recipes! I’ve made 3 small jars of this recently as I have had a bunch of radishes each week from my veg box. I like to add spring onion tops, chopped and some fermented jalapeno pepper plus fresh or fermented ginger for extra bite! Very tasty. Quick to make and ready to put in the fridge after only a few days. Wow, that sounds very tasty! Thanks for sharing. 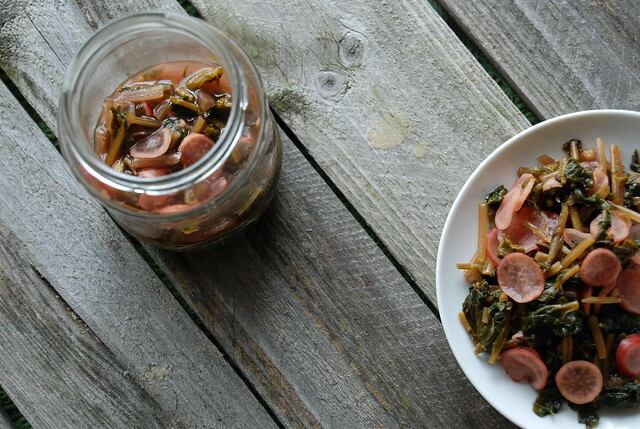 Vinegar pickles are a different process than fermented pickles. Vinegar kills all bacteria; salt suppresses bad bacteria until good bacteria that preserve take over. So, no, just salt, no vinegar.